A glass drinking flask with a unique velvet touch grip and an antibacterial olive wood lid. Wide mouth, steady flow, and a twist-lock plug to ensure the bottle is leakproof. Certified non-toxic and microwave and dishwasher safe. Blackish grey colourway. 600ml. One million plastic bottles are purchased every minute, reduce your waste with a plastic free alternative. 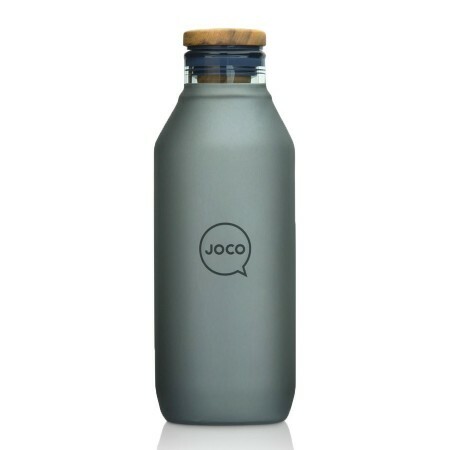 JOCO is an Australian company, who focus heavily on creating eco-innovative products. Wide mouth opening makes the bottle ice cube receptive, and easy to clean. Twist-lock plug ensures that the bottle is completely leakproof. Cover is non-slip with a velvety touch. Bottles are hand blown from high-grade borosilicate glass. They are thermal shock and etch resistant, lightweight and durable. Olive wood lid is non-porous, naturally antibacterial and odour resistant. Certified non-toxic and BPA free. High-grade borosilicate glass, olive wood lid. 600ml. 7.6 (W) x 20.2 (H) cm, with 4.5 (W) cm lid.